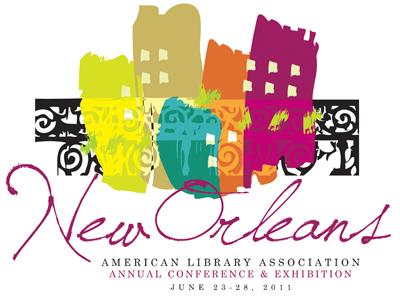 Attending the American Library Association (ALA) 2011 Annual Conference in New Orleans last week once again inspired a deep appreciation for how technology, people, and dreams are combining to create onsite and online communities extending beyond anything imaginable even a decade ago. As those of us involved in workplace learning and performance continue reading the reports we collected, thinking about the numerous inspiring conversations we had with colleagues, and recalling the overwhelming number of opportunities we had to see what is happening in libraries and the communities they serve today, we’re struck again by how the themes of community and collaboration are at the heart of what many are doing and exploring in contemporary libraries. And nowhere is that more clearly evident than in the pages of Confronting the Future: Strategic Visions for the 21st Century Public Library, a first-rate report written by ALA Office for Information Technology Policy (OITP) fellow Roger Levien. The writer quickly moves from the obligatory lofty statement we often see—“Public libraries play a distinctive and critical role…that is essential to the functioning of a democratic and market-oriented society” (p. 12)—to more from-the-heart suggestions of how libraries are partners within their communities: a “place at which most people could learn how to use innovative devices and media even before they became widely available and affordable” (p. 24)—an essential service at a time when learning never ends and many of us feel perpetually overwhelmed by all the new information and technology that comes our way. A place that “would also facilitate collaborations among individuals” (p. 24)—in other words, a real player in building and sustaining a sense of community. And a place offering “a range of specialized equipment and facilities to help authors, editors, performers, and other creators prepare new works, alone or in groups, in new or old media, for personal use or widespread distribution” (p. 26) as we already see in facilities as innovative as the Chicago Public Library’s magnificent YOUMedia collaboration with the Digital Youth Network for teens. Levien persuasively reminds us that staff members of responsive and innovative libraries are providing resources for almost every imaginable member of our communities. They offer events “designed to educate, inform, and entertain children.” They provide a “safe, neutral, and flexible environment that many teens and their parents strongly prefer.” They have an increasingly wide array of services “to help in searching for employment, completing unemployment insurance applications, finding books and courses on new skills and new careers, and simply enabling adults to have a quiet place to read or relax. Many offer courses in the use of information technologies” (p. 17). They also create reading, meeting, and social learning centers that are better equipped than other community centers are. There are even better times ahead, Levien suggests. Libraries are continuing to build bridges between their physical and virtual sites to meet the needs of onsite-online customers. Members of library staff are looking for ways to combine a focus on individual needs with a focus on community needs. Libraries are not only collecting but creating content to the benefit of those they serve—in essence, becoming content libraries that develop the very communities that they help sustain. And libraries are finding new ways to serve as portals to information as well as being accessible archives of information resources. “The creation library has extended its role and become a place where media conveying information, knowledge, art, and entertainment are created using the library’s specialized equipment and facilities,” he notes (p. 20)—a reminder that those who have fallen away from using libraries can learn a lot simply by revisiting them onsite and online to see how much positive change is taking place within those community centers. And we, as trainer-teacher-learners, have our own role to play. We have the responsibility to continue shaping what our libraries are offering; remain more than proficient in using what libraries offer us; and help our learners become more aware of, comfortable with, and effective at using library resources. Libraries are a critically important element of our local and extended communities in our onsite-online world. It’s up to us to be sure that the old and new technology they harbor doesn’t hide the opportunities they offer us—including their role in fostering business partnerships and community collaborations to support creative learning opportunities in even the most challenging of times. Trainers and other perpetual learners are information junkies. We thrive on what we learn and share. We revel in those moments when boundaries dissolve and we embrace a seamless role of trainer-teacher-learner rather than simply delivering a lesson and hoping that participants in a learning opportunity will remember something that we said. We, like those whose learning we facilitate, have our cherished sources of information: friends; colleagues; printed newspapers, books, magazines, and their online counterparts; our favorite librarian; and/or the waiter, waitress, or supermarket checkout clerk who calls our attention to what we might not otherwise notice given the demands that information overload puts on us and all we encounter. There are also the reports without which we would feel diminished. 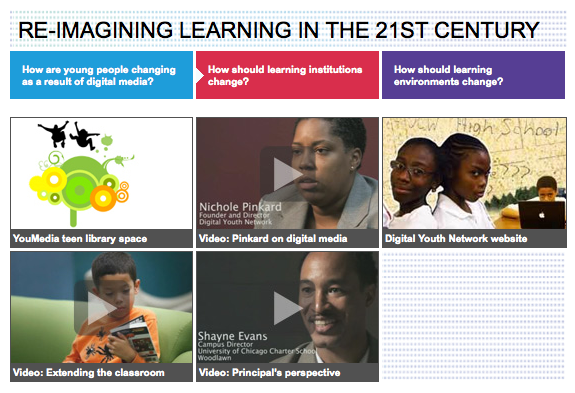 One of those, for me, is the New Media Consortium (NMC) annual Horizon Report, an engaging free online document designed to “chart the landscape of emerging technologies for teaching, learning, and creative inquiry,” as Consortium representatives explain on their website. To read the main and subsidiary reports inspires thought and action. 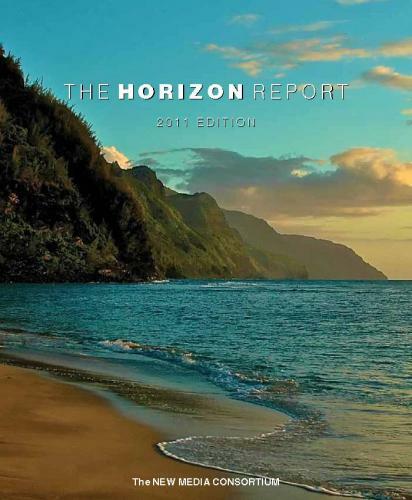 Writing about the reports has become an annual ritual for me ever since I attended a live Horizon Report presentation in 2008. And to cross over to the other side of the Horizon this year by serving on the 2011 Horizon Report Advisory Board and helping shape the next report—which, of course, I can hardly wait to read when it is released in February 2011—has been an exercise in collaboration which has changed the way I work. At the heart of the Horizon report process is the wiki that provides a virtual meeting place where Advisory Board members from several different countries asynchronously contribute to the development of the report. The lesson here for all of us as trainer-teacher-learners is at least twofold: a) as participants immersing ourselves in using a tech tool as contributors rather than solely as readers, we educated ourselves and became comfortable with exactly the sort of tech change we were documenting for others, and b) we would not have been nearly as successful as we were without guidance—in this case, from New Media Consortium Chief Executive Officer Larry Johnson and his NMC colleagues, who themselves served as trainer-teacher-mentors throughout the brief and intense period of work. Larry and other NMC staff, throughout the two-month process, guided us with concise, welcoming, supportive email messages; online tutorials; and instructions on how to approach and complete each step of the process—and then they turned us loose to learn, work, and collaborate. The pleasures of exploring new technology with other Advisory Board members via the wiki never seemed to end, and the serendipitous discovery early in the process that an ALA Learning blog colleague—Lauren Pressley—was among my Advisory Board collaborators once again reminded me how small the world has become through the use of shared online tools. Workplace collaboration, in this case, went far beyond the structure of the staff and Advisory Board’s contributions to the wiki: the entire process was visible, via that wiki, to anyone who wanted to follow it. When the original list of more than 30 technologies we were exploring was winnowed down to a short list, that information was posted publicly for anyone to view—which means that part of the process was to provide a magnificent resource for anyone interested in exploring the topics on their own. The process, furthermore, has produced a list of online press clippings that is an additional resource for anyone wanting to explore the tech topics that were under discussion during the Advisory Board’s online time together. For anyone who is still wondering why more and more people are exploring wikis as a first-rate collaboration tool and how they provide effective ways for all of us to work together, the entire Horizon Report process is a complete course within itself. And, like any first-rate learning experience, it leaves us with an expanded toolkit that changes the way we work once we have become engaged. Ultimately, it leads us to another level of building communities of learning. It appears to be time to further develop what Ray Oldenburg initiated with The Great Good Place. That wonderful and still-influential book, first written and published more than twenty years ago in a pre-World Wide Web era, suggests that our first place is our home, our second place is where we work, and our third place is the treasured community meeting place where we, our friends, and colleagues come and go. The idea of the third place has been embraced by many, and has a counterpart in “the Intersection,” which Frans Johansson describes in his own more recently published book, The Medici Effect, as a place where people of differing backgrounds meet, exchange ideas, and, through their intersection, develop and disseminate new ideas. What seems to be ripe for development now is a complementary fourth place: a community gathering place for social learning. The idea for this version of a fourth place (more about other versions in a moment) came out of a discussion two days ago with colleagues participating in the latest episode of Maurice Coleman’s biweekly T is for Training podcast—which, in its own way, has become an online third/fourth place for an ever-expanding community of learners comprised of those involved and/or interested in workplace learning and performance in libraries. The potential development of the fourth place as community gathering place for social learning is worth exploring in and of itself since it embraces all that the concept suggests and it serves as an online example of what both Oldenburg and Johansson describe in face-to-face settings. Coleman’s latest podcast began with a handful of us discussing what we would love to see discussed at the annual Computers in Libraries conference, to be held in Washington DC in March 2011. Because T is for Training colleague Jill Hurst-Wahl, who serves as Assistant Professor of Practice in Syracuse University’s School of Information Studies and is involved in planning the conference, was participating in the discussion, we quickly started dreaming about topics that have been on our minds, including the idea that “Computers (and Humans) in Libraries,” with a strong emphasis on listening to what library users want from libraries, might open some doors and eyes. As if on cue, the remaining participants—Coleman, Library System of Lancaster County Training Coordinator Stephanie Zimmerman, Statewide MarylandAskUsNow! Coordinator Julie Strange, and I—were joined in our Intersection by a contributor who had not previously called in during one of the live online sessions: someone who identified himself as Rutgers University student Walter Salem. Salem was exactly what we were seeking: a person who is not involved in training but who expressed a passion for what libraries are, what they have been, and what they are becoming. While he was commenting via the audio portion of the program, a few of us noted via the typed chat that he seemed to be describing Oldenburg’s third place, and we actually suggested that to him. At that point, he corrected us by emphasizing that what he really loved was the sense of a place where he was surrounded by learning and the potential for learning, and that’s where we started translating his thoughts into something concrete for libraries and any other onsite or online community willing to use all the tech and human tools available to us. “Maybe we’re looking at a ‘fourth place’: the educational community meeting place where members of the community gather,” I suggested via the typed chat. It didn’t take long for all of us to agree that this is an idea well worth nurturing and promoting, and Coleman had, before the live discussion ended, provided the refined fourth place definition with which we are working: “a community gathering place for social learning.” And while all of us were specifically thinking of the roles libraries could play as this sort of fourth place, it’s obvious to me that there’s room for fourth places of this level in almost any onsite or online setting where learners come and go, where they seek a community of support and a chance for Intersection-level exchanges, and where the place itself serves as and inspires communities of learning. So perhaps what we are working with are sub-sets of Oldenburg’s original third place—communities with specific interests. Or an entirely original version and description of the important places in our life. Or, perhaps with yet another nod to the brilliance of the entire Web 2.0 and Learning 2.0 phenomena, we’re looking at Place 4.0, and an acknowledgment that there is room for all three proposals described here: a series which begins with Place 4.1, Place 4.2, and Place 4.3, then continues with the infinite possibilities of places that are different, yet intrinsically connected to, what Oldenburg has set in motion. Let’s see how many interesting Places this might take us or produce. Updates: Jill Hurst-Wahl, on August 17, 2010, has continued the conversation on her Digitization 101 blog (at http://hurstassociates.blogspot.com/2010/08/community-collaboration-and-learning.html). “Many…won’t be able to simply pick up where they left off when growth returns—they’ll need to retrain and find new careers,” Deputy Managing Editor Don Peck tells us in his thought-provoking, in-depth, and beautifully written article “How a New Jobless Era Will Transform America” which appears in the March 2010 issue of The Atlantic and on the magazine’s online site. Which is awful news for those who thought they were finished learning after they graduated from high school. Or college. Or finished earning a Master’s degree. Or a second or third Master’s degree. But for trainer-teacher-learners, this is nothing if not an absolute calling to rise to the challenges of our profession. It’s been clear to a lot of us that learning has been a life-long necessity for many years now. That’s why we spend so much time continuing to hone our own skills, attend workshops, and occasionally return to more formal academic programs at times when our predecessors were reaching the peaks of their careers or even winding down in anticipation of retirement. What Peck does masterfully is take a relatively long view of jobs and joblessness stretching from the Great Depression to the current devastating recession, catching us up on sources ranging from Mirra Komarovsky—a sociologist whose work on the Depression included The Unemployed Man and His Family—to Gary Burtless from the Brookings Institution, who is quoted as saying that “every time someone’s laid off now, they need to start over. They don’t even know what industry they’ll be in next.” And in the course of his explorations, Peck indirectly reminds us that the need for first-rate trainer-teacher-learners is far from limited to times of economic distress: “the recession has merely intensified a long-standing trend,” he writes. “Broadly speaking, the service sector, which employs relatively more women, is growing, while manufacturing, which employs relatively more men, is shrinking.” If we’re not there to provide training and support for those in what we all-too-dispassionately call “transition,” we’re missing a life-changing opportunity to make significant contributions to the communities we serve. Peck seems to be thinking globally when he concludes that we “are living through a slow-motion social catastrophe, one which could stain our culture and weaken our nation for many, many years to come. We have a civic—and indeed a moral—responsibility to do everything in our power to stop it now, before it gets worse.” And if those of us with training-teaching-learning skills take that message to heart, we can be part of a much needed solution. Which brings us back to the experience that inspired this two-part article: by continually educating ourselves, exploring new tools which become available to us, and sharing what we learn through online social networking tools including Google Buzz, we contribute to and help develop the communities of learning we so desperately need. If we want to provide effective learning opportunities, we need to build reflection into the process from the beginning and encourage learners to participate in setting their own learning goals. A third critically important element of successful transformative and reflective learning involves acknowledging and remembering that learning is a process, not an event, and that processes, as we know, require participation, and follow-up if they are going to be successful. The approach De Anza College Distance Learning Center staff take through the “Distance Learning Questionnaire” they adopted many years ago from the PBS-Adult Learning Service leaves us with a first-rate example of what we should all be considering. Although it is designed to help students determine whether they are ready to engage in online learning, it also serves to remind workplace learning and performance professionals that we have an equally important role to play in preparing ourselves and those with whom we work to build foundations for success from the beginning. What is wonderful about the questionnaire is that it asks questions designed to provoke thought and reflection: How important and time-sensitive is the prospective learning experience to the learner? Do the learner’s habits lend themselves to success in an online learning environment? The questionnaire immediately offers guidance to those who complete it. Achieve an appropriate score on that questionnaire and it appears you are ready to proceed. On the other hand, if your score is lower than successful learners achieve, the advice is straightforward: “you may need to make a few adjustments in your schedule and study habits to succeed” or, for those with the lowest scores, “distance learning may not currently be the best alternative for you; talk to your counselor.” Hard advice, yet very helpful to all involved if we’re looking for long-term results. If forewarned is truly forearmed, De Anza College staff and instructors are doing a great job of preparing everyone for learning successes, and there’s a lot all of us can learn from their example as we carve out time for our own reflective moments.